4 months down the road. I would have probably put on 1-2 kgs from all these ice cream. So if u’re wondering why these apricots are small, they’re sugar apricots. These are much smaller then the regular apricots and of course, sweeter. Personally, I’m not a great fan of apricot, raw or dried, as it’s usually quite tart and ‘raw’, and particularly expensive. So this time when I saw them in the market, priced at RM 10 / punnet, it’d be quite a good time to try them. Further, it says “sugar apricot” so, if it’s not sweet, it wouldn’t be called that right? Otherwise it’d be cheat. 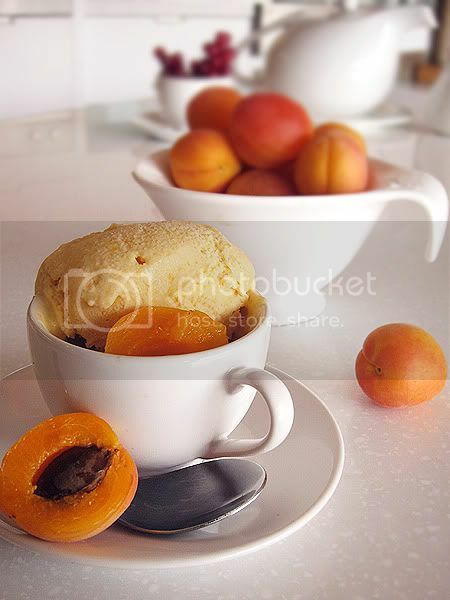 Apricots are very high in beta-carotene and lycopene, two antioxidant compounds commonly found in orange-red fruits and vegetables, that promote heart health and prevent several types of cancers. Beta-carotene and lycopene also protect LDL cholesterol from oxidation, reducing the risk of developing atherosclerosis and several cardiovascular diseases. 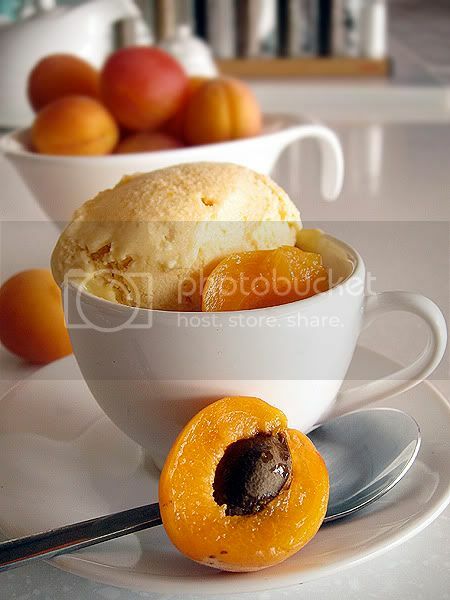 Slice open the apricots and remove the pits, then cut each apricot into sixth. But in my case I just quartered them. 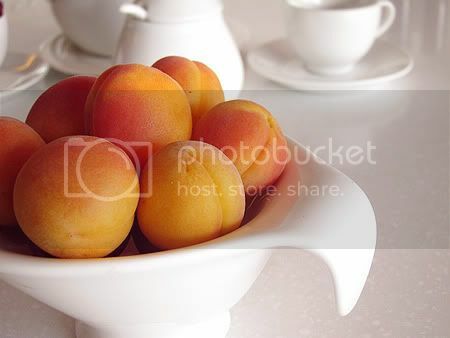 Cook the apricot pieces with the water in a covered saucepan over medium heat until tender, about 5-8 minutes, depending on the size of apricots, and stirring occasionally. Remove from heat and stir in the sugar until dissolved. Let cool to room temperature. 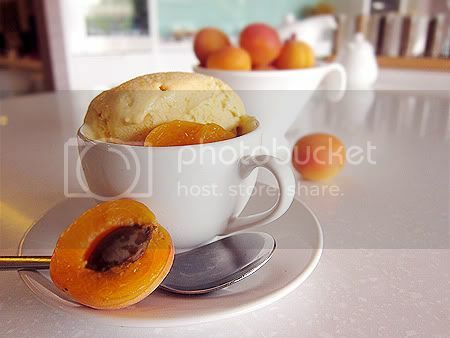 Once cool, puree the apricots and any liquid in a blender until smooth. If there are any small fibers, press the mixture through a mesh strainer to remove them. Stir in the cream and lemon juice. Chill mixture thoroughly in the refrigerator then freeze it in your ice cream maker according to the manufacturer’s instructions. With my cuisinart Ice Cream maker, it took about 60 minutes as the amount was quite big. Taste wise, it’s not as heavy as the usual ice cream as this one has water + cream instead of the milk + cream. I also think it’s important to strain the puree as apricot has a lot of fibers. With the leftover remainings in the sieve, I puree that with cream, then strain. That way, I don’t waste much of the fibers, plus the cream and puree is well mixed! It was smooth and sweet, a little almond-ish but not so like the cherry/almond taste. Oh, and if you realized, there’s NO EGG in the recipe!! Beautiful ice cream. I’m trying to learn to make more ice creams especially those with fruits. This one looks very tempting. Thanks very much for sharing. Love to see so many different ice cream recipes! Keep up the project 🙂 Love it! I think I’ve read your other blog before..the blog you had when you were still at le cordon bleu!! Hey Bakericious, what happened to ur fridge? ?